In the second of our series of blogs raising awareness of Erb’s Palsy, this blog looks at the injuries caused by damage to the different brachial plexus nerves and how that damage impacts upon a person. As explained in Joachim’s previous blog, Erb’s Palsy is a condition caused by damage to brachial plexus nerves in the neck and causing weakness in the affected arm, usually suffered at the time of a person’s birth. In this blog we look at the different degrees of peripheral nerve injury. 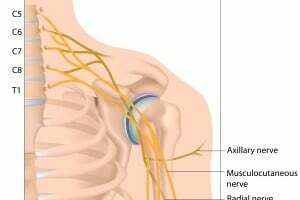 The extent of the Erb’s palsy depends on which of the nerves in the brachial plexus were damaged and whether the nerves were torn or bruised only. If the latter, some spontaneous recovery can be expected. There are two forms of assessment of obstetric brachial plexus injuries. Firstly, an assessment is carried out to assess which nerves have been damaged and according to which nerves have been damaged, the injury is classified as a group 1, group 2, group 3 or group 4 injury. Group 1 is the least serious with the fifth and sixth cervical nerves being damaged. The child is born with paralysis of the shoulder muscles and of the elbow flexors. The hand is normal. Full spontaneous recovery occurs in approximately 80% of cases. Group 2 injuries refer to those where the fifth, sixth and seventh nerves have been damaged. The child is born with paralysis of the shoulder, elbow and wrist extensors. Full spontaneous recovery occurs in approximately 60% of these cases. Group 3 refers to cases where there has been damage to the whole of the brachial plexus and the child has complete paralysis of the arm and shoulder. There is a 30-40% recovery rate. Group 4 is the most serious and occurs where the nerves have been avulsed (detached) at their root. The child will usually have a Bernard-Horner syndrome where the corresponding eye to the brachial plexus is affected and the eyelid droops. There is no spontaneous recovery. Within these groups there can be variability in the severity of the damage to the individual nerve fibres. The second form of assessment therefore looks at the quality of the injury to the specific nerve fibre. This can only be assessed at operation or, by the quality of the recovery. The mildest level of damage to the nerve is a simple bruise where the nerve stops working for a short period of time, usually a month or less. This is called a neuropraxia and a full recovery can be expected. The second level of nerve damage is called an axonotmesis and consists of damage to the internal wiring of the nerve but preservation of the insulation around the actual wire. Excellent recovery can be expected as the insulation acts as a guide for the regrowth of the nerve fibre. Recovery in this situation usually takes 3-4 months for the shoulder and longer for the elbow and fingers. The final level of damage is termed neurotmesis and consists of damage to both the internal wiring and the insulation around the nerve fibre. The nerve fibre has to find its own way though the scar tissue, complete recovery can never be expected and regrowth takes substantially longer. In general, nerve injuries tend to be mixed in the nature of the injury. Therefore, even in a case which is defined as neuropraxia by a doctor, there can be some fibres that have been severely damaged. Each case of Erb’s Palsy is different. The paralysis can resolve on its own over a period of a few months or necessitate rehabilitative therapy, or require surgery, depending on the severity. In our next blog tomorrow we look at the types of surgery or therapies that can be provided depending on the injury suffered.